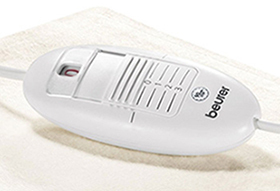 Another gorgeous heating pad from Beurer which is sure to leave you wondering how on earth you ever functioned without it. If you have never experienced the true indulgence of a heating pad before then the HK25 is a superb place to start! Gone are the days where you have to mess around filling a hot water bottle, which we all know will leak 9 times out of 10! Mess free and stress free the HK25 heating pad will provide you with soothing heat when you most need it. The HK25 involves nothing other than stress-free relaxation while enjoying the comfort that heat can bring to your mind and your body. If you have had a long, tiresome day at work or maybe you’re feeling the pain from a bad stomach ache, the heating pad will become your savour as it eases whatever sort of tension the day has brought you. With its cosy fleece finish you can happily drift off to the land of nod snuggled up to the pad and take comfort in its BSS safety system, knowing it will automatically switch off after 90 minutes. The electronic sensor technology built into the HK25 prevents the surface of the heating pad from overheating by automatically switching off in the event of any possible fault or issue. 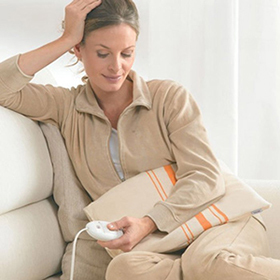 If the safety system switches the pad off automatically as a result of a fault, the temperature display on the unit will not remain illuminated even when the heating pad is switched on. 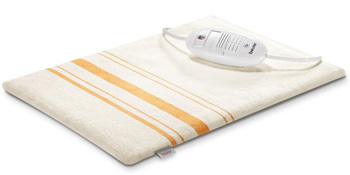 What are the benefits of the HK25 Heating Pad? Life’s too short to put up with discomfort. Ease those aches and pains today by indulging in the huggable Beurer HK25. Enjoy its 3 different heat settings and feel free to gently nod off as the automatic switch off function will turn off the heat after 90 minutes.